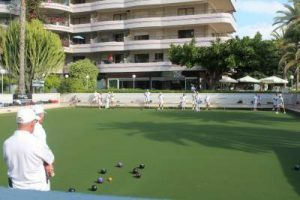 CALPE BOWLS CLUB PARAISO MAR. Bowling Paraisomar Edf. Paraiso Mar, Levante Beach, Calpe. Edf. 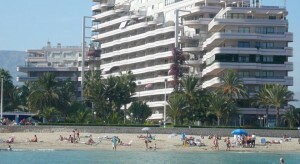 Paraiso Mar, Levante Beach, 03710, Calpe, Alicante. 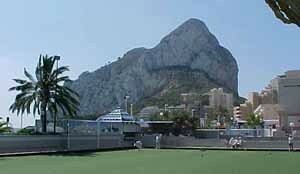 The Peñon de Ifach rock provides a dramatic backcloth to the green. The club’s kiosk can be seen at the far corner. Bowling Paraisomar Paraiso Mar Bowling Club. Four rink bowling green. Artificial carpet. Outdoors. 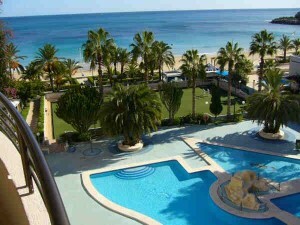 On a very exclusive location in front of the beach in Calpe, Alicante, Spain. We organize for good accommodation, value for money, indoor heated pool included,spa. Club organization, we have more than 60 memebers and federated in Costa Blanca League. It is ideal for small touring groups. 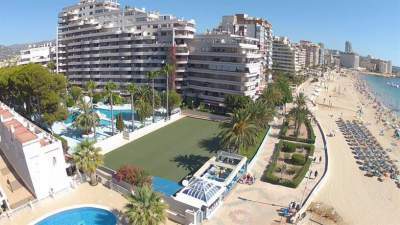 The greens are beautifully situated on the Levante Beach sea front and promenade with many cafes and restaurants nearby. Groups of bowlers would enjoy the opportunity of playing bowls against different sides each day on this well positioned green. The green forms part of an excellent seafront apartment complex, where bowlers should be staying. Near the accommodation, you will find many restaurants which serve a 3 course meal with wine for under 10 euros. Bookings for restaurants can be arranged. Ask for our special offers in accommodation and ask for quotes all in price..
Green fees (non subscribers) per person €7, – 2 hours session. Calpe Bowls Club Dinner Dance. Calpe Bowls Club Presentation Dinner Dance. Is the southern most province of Valencia region. It’s coastline is called the Costa Blanca. The capital Alicante is approximately half way down the coastline. All the bowling clubs in Alicante are reasonably near the N332 coast road, which runs from Javea down to Torrevieja. Alternatively, you can use the AP7/E15 motorway,(the Alicante – Ondara stretch is a toll road). 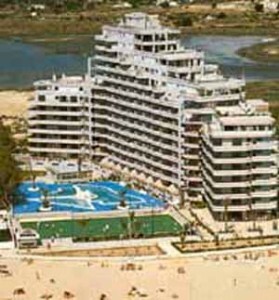 SPAIN INFO San Francisco De Asis,Urb Marina, San Fulgencio, 03177, Alicante, Spain. Paraiso Mar Bowling Club Edf. Paraiso Mar,Levante Beach,Calpe, Lawn Bowling in Spain. Bowling Paraisomar Calpe Paraiso Mar Bowling Club Edf. Paraiso Mar,Levante Beach,Calpe, Lawn Bowling in Spain.